Edit: Unfortunately I can’t post a direct link to the video (hello monetization!) so I’ll post a link to polygon.com’s article where the video is available. This is one of the most amazing things I’ve ever seen done in Minecraft. Two friends, one a designer and one a programer, have decided to recreate the original Legend of Zelda within Minecraft. LoZ is, of course, a two dimensional game. But they have turned the game into a fully functional, 3 dimensional, exact replica of the LoZ map! While this is technically still a work in progress, the map is fantastic! 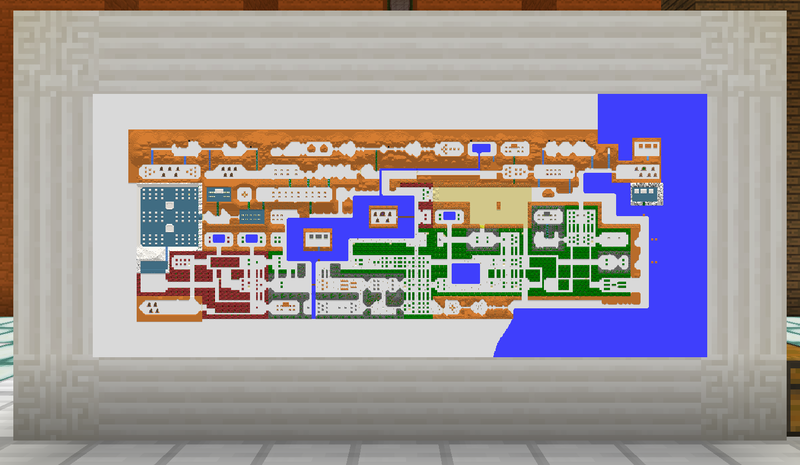 Let’s take a look at what the actual Nintendo Legend of Zelda map looks like. And here’s a look at the in-game map showing an overview of the world. That’s some serious dedication … and keep in mind that buildings, mountains, trees and other in-game objects are three dimensional! The true beauty of this project is exploring the limits of what Minecraft can do, as well as the incredible ingenuity required to make everything work. On a smaller scale, this has some exciting implications in the classroom. Historical events, real cities and other places can be recreated and characters or historical figures can be programmed to interact with players as they explore the map. Puzzles, hidden treasures and monsters can all be included to make the game interactive, realistic or just more fun! … it’s so exciting to see the iconic room with the old man and see the words “It’s dangerous to go alone. Take this!” appear on the screen. (Disclaimer, this post is more of a rant and less of an academic critique!) Every teacher has heard it hundreds of times – there’s this crazy rhetoric amongst school officials that “student to computer ratios” and “number of smart boards” are excellent metrics for evaluating how well a school has “incorporated” technology into the school environment. Yet, the reality inside classrooms is that the technology is rarely shared beyond ICT. English, math and science rarely use computers or labs. Smart boards are gathering dust in the corner of history classrooms. Teachers are too busy to rebuild their curriculum around technology and many are too afraid of technology to try and do more with it. Add to that the fact that technology breaks, becomes obsolete every two years and technical problems eat up valuable instruction time. So it’s no surprise the European Commission has concluded 63% of 9 year old students are missing the digital equipment they need at school. Between 50% and 80% of students in EU countries never use digital textbooks, exercise software, broadcasts/podcasts, simulations or learning games. Most teachers at primary and secondary level do not consider themselves as ‘digitally confident’ or able to teach digital skills effectively, and 70% would like more training in using ICTs. Pupils in Latvia, Lithuania and the Czech Republic are the most likely to have internet access at school (more than 90%), twice as much as in Greece and Croatia (around 45%). Let’s be honest … this shouldn’t be a surprise. Currently teachers are severely undertrained for using computers or any technology in the classroom. Digital textbooks are few and far between, learning games are limited (too specific, too expensive, too outdated). Many teachers have no idea what a podcast is. Existing software is poorly used and rarely implemented. Technology is outdated and inadequately maintained. And I think that’s being quite generous! Decisions about technology in schools is being made by politicians and bureaucrats … and to make matters worse, there’s no consensus on what technology has value and how it can be applied in a standardised way across schools. But to be fair, and taking a step back, this is not an easy problem to solve. By the time schools get around to agreeing on a strategy, the technology they are considering is already old. Teachers need to be trained and re-trained regularly. Technology needs to be maintained and updated every few months. Despite which, schools will still be years behind the cutting edge … while students are years ahead, already adept at using instagram, whatsapp, facebook and other new apps to communicate online. However, one possible way forward is by looking closely at teachers. The teacher is the interface between the education system and the students. The teacher is the conduit. So it’s the responsibility of the education system to make sure teachers are able to do that job effectively. But how? Teacher training already has mandatory learning areas for would be teachers. They must learn about student welfare, learning methodologies, social justice, pedagogy and practice, and other areas that relate to effective teaching. Yet, very few universities have mandatory technology training for teachers – including how to use that technology in a classroom. And I’m not talking about smart boards. I’m talking about using Google groups as virtual classrooms. I’m talking about using iphone/android apps to communicate with students, record test scores, share resources. I’m talking about podcasting, documentary making, social media, RPG storylines and other technology areas being core parts of a teacher’s curriculum. I’ll get a lot of hate for this, but if teachers can’t use technology, they probably don’t belong in a modern classroom. The trend now is BYOT – bring your own technology – and if teachers don’t know how to utilise the technologies they have available to them, then they are doing a disservice to students. Step 1 is start with rebuilding teacher training courses at university. Step 2 is less reliance on gimmicky technologies and more reliance on curriculum writing that takes advantage of student skills, personal technologies (smart phones) and access to hardware (computers) and software (apps) that will help students to achieve their goals. Today’s luddite test: How many teachers use dropbox or cloud storage for their teaching resources? 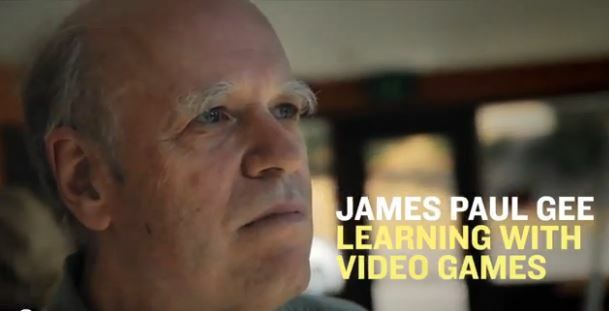 Game-based learning should involve more than a game as a piece of software. It should involve designing what Arizona State University Professor James Paul Gee calls “Big G Games.” In the 50th webinar for the edWeb.net Game-Based Learning community, Gee discussed how Big G Games integrate a game as software with good interactional practices, good participatory structures, smart tools, and an emphasis on production and not just consumption. Often, out of school, such Big G Games involve what Gee has called “affinity spaces,” Internet spaces where people self-organize around a passion. Game-based learning leads naturally into a discussion of 21st Century learning and paradigm change for schools. View the webinar to find out how these “affinity spaces” are often part and parcel of even entertainment games today and how they create learning systems with properties that are quite different from schools as we currently know them. Regardless of your views of education, learning, gaming, gamification, serious games or any other buzzword that is thrown around, games like Minecraft are proving themselves to win people over for their inherent “fun” factor and potential as a learning tool. Not everyone agrees that games can be useful for learning and sometimes that isn’t even the point that those of us who extol Minecraft’s virtues are trying to make. One recent article considered how much fun Minecraft was and made the point that has no educational value, yet, still has value as a tool which promotes creativity. Again, that’s the whole point of Minecraft. Whether or not learning is directly implied, Minecraft is fun and has value that is (without a doubt) tangible. Minecraft is a creativity game that allows children to express their creative side through building and construction. It’s a cooperation game that encourages players to work together. It’s a planning game that forces participants to calculate what they need and how big things are going to get. It’s a challenging game that invites users to expand their horizons by building PCs, writing mods, participating in communities that develop Minecraft plugins. It’s an expressive game that inspires its fans to draw comics, paint pictures, write jokes and sing songs. Minecraft is all of those things … and at the end of the day there’s no test. There’s no essay or assignment. There’s no teacher marking down grades on a rubric. There’s only fun … and through fun comes the learning. When you play computer games you learn, whether you want to or not … and that’s a pretty good reason to play games! *For the record: There is a Minecraft curriculum. Minecraft teachers write units and build curriculum around the game and teach it in their classrooms. But that’s not the point. Minecraft inspires people to play, and to learn, and to do amazing things. You don’t need a curriculum for that! Before I start this post, I’m going to predict a regret to use such a large, vertical image. I bet it’s way too big (thus, impractical) for this page! LOL … Anyway, Project Zomboid is an alpha release game currently available through its website projectzomboid.com or on steam (http://store.steampowered.com/app/108600/). I’ve just started playing this game and, while I’m only doing beginner levels, I can see a lot of potential this game might have as a learning tool. Wait … what? Zombie game? Learning tool? Oh … yeah! Project Zomboid is a fun little isometric semi-open world based on Kentucky, USA. In the game you are the lone survivor (single player) in an apocalypse world overrun by the zombie hoard. Your job: survive. I’ve died … a lot! It’s awesome! Where I see potential in this game links back to another post today about project based learning. Using a multiplayer server, it would be possible to set up situations where learners are forced to work together to survive. They would need to find shelter, amass a storage of food and weapons, fortify their safe house, explore the map and, of course, kill zombies. Even rationing out food, nails, weapons and jobs is a serious consideration. But it’s not as easy as it sounds. The game limits the player by making you scared when you see zombies (shooting accuracy lowers), fatigued when you run, injured when you carry heavy loads, hungry and tired. The player even becomes bored or depressed at night when there is little movement and nothing to do except wait until morning. While not ostensibly educational, it would be an amazing team building exercise. Players work together to survive. One player dies, they all start again! Beyond the game, there are other opportunities to make custom maps, configure servers, make mods and participate in the community. Game based learning requires thinking out of the box. Open world games like Kerbal Space Program and Minecraft have a more overtly educational nuance. However, that doesn’t mean first person shooters and zombie survival games can’t be educational too. The game isn’t the outcome it’s the medium. It’s just a matter of how you use it. As a fun little follow up to a recent post about celebrities playing Minecraft, JK Rowling today tweeted that she’s working on a book but is distracted by other interests – including Minecraft. This, of course, caused a stir amongst the Minecraft fanbase. 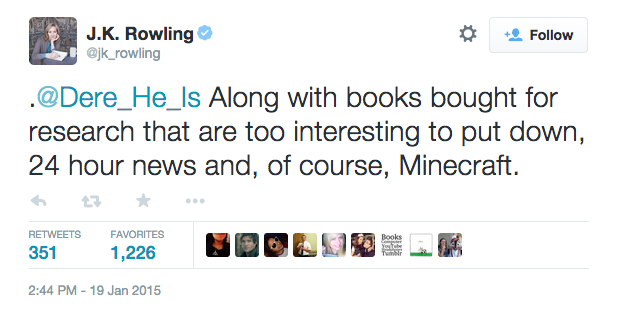 If I had to guess what Ms Rowling’s favourite activity is while she’s playing Minecraft, my guess would be … enchanting! American rapper Waka Flocka Flame plays Minecraft on a popular server called Minecraft Universe. It’s inevitable that celebrities and their children are discovering the joy that is Minecraft. Even actors as big as Jack Black have been spotted wearing Minecraft tshirts in the wild. Ostensibly, this has little educational value, but promoting Minecraft using the “celebrity cred” draws more attention to the game and elevates its status as important and relevant. Hopefully, some of that coolness can overflow into education and we can benefit from it too! Solid evidence that gaming improves perception and motor skills – and that skills are transferable! Some excellent studies have shown the value gaming has in motor skills, perception and decision making. Dye, Shawn Green and Bavelier have spent a number of years continuously experimenting and improving on their research surrounding whether people’s ability to make decisions or perceive things is affected by games. The overwhelming result is that gaming does have a significant impact on certain skills. Of particular interest is the conclusion drawn that, from these experiments, the assumption can be made that skills learned during gaming are transferable … a critical issue in education and learning fields. One area that is confirmed to be improved is the ability to pay attention (attentional capacity) during an activity. Gamers have a longer attention span and can focus better on a task and improved results (accuracy). Most interestingly, the study didn’t just conclude that gaming improves visual attention skills. As a second experiment, participants were divided into groups to play two different games. One group played an ‘action game’ called Medal of Honor. The other group played Tetris. Both groups achieved better results on the tests than groups which didn’t play video games as a ‘training’ tool. Most interestingly, the participants who played Medal of Honor did better than the participants who played Tetris. The study was able to conclude that 10 days of action game training is sufficient to increase visual attention capacities. Further, action video game playing pushes the limits of different areas of visual attention. The researchers argue that the nature of games and the inherent visual multitasking provides significant visual skill training.